DON'T SORT OUT ORDER MAILS ANY MORE! Netpas MMA is a mail analyzing application which helps you to reduce time, effort and cost on your daily order mail sorting. 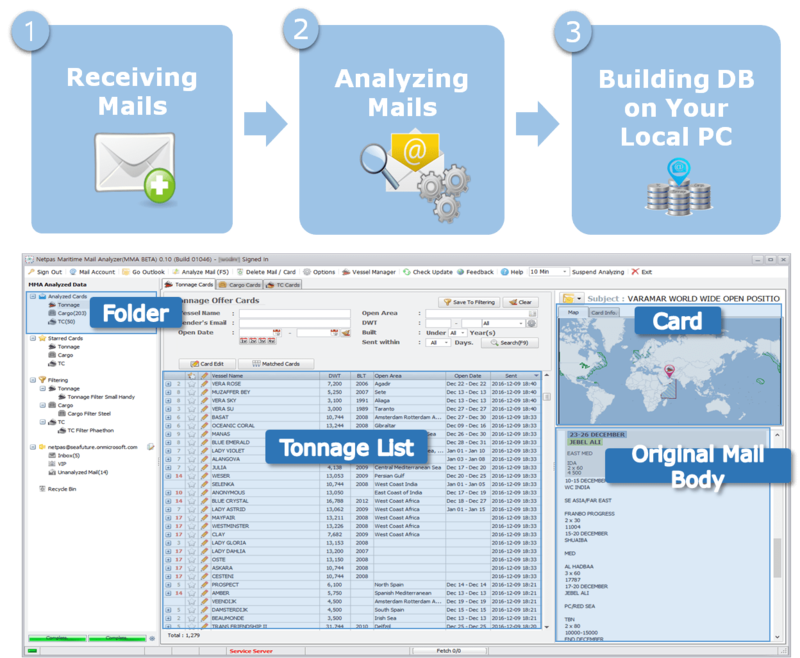 Netpas MMA analyzes and parses tens of thousands of mails and creates your own database on your PC. Netpas MMA automatically searches, filters and matches the cargos and vessels for you. Release yourself from a time-consuming job. Just have a cup of coffee in the morning instead of sorting the mails received over night. Netpas MMA will prepare everything for you to start your job instantly. When you have an order requiring instant reaction, the first step you have to do is to check Netpas MMA. Netpas MMA will give you real time candidates for the business in your mail box with the accuracy better than human. Netpas MMA will give you the strongest competitiveness. By clicking any vessel, you will see suitable orders for the vessel in your database. By clicking any cargo, you will see suitable vessels for the cargo in your database. Matching is one of the most powerful functions in Netpas MMA . It will give you new business chances you might have missed before. Do not worry. Your mails or MMA analyzed cards are not duplicated or transferred. They are all secured and stored on your local PC only. Netpas MMA is currently provided as Free Beta. You can enjoy it without charge. Do not miss out any business opportunities. Your work will be easier and more accurate ever with MMA. MMA will help your business more competitive in maritime market.